Author, in charge of the storyboard. Author, in charge of production. The ‘Paris Week’ was was celebrated as both a political symbol of Franco-British post-war collaboration - the badge of a new ‘entente cordiale’. Already in 1950, television signals crossed for the first time the Channel, celebrating the 100th anniversary of the laying of the first telegraph cable between France and Britain in 1850. Both the Calais experiment and the Paris Week were a powerful technical demonstration of the possibility of doing transnational television at a time when most of the European countries not even had inaugurated national services. Because of the different television standards in Europe, doing transnational television transmissions was a technical challenge for television engineers and technical staff. 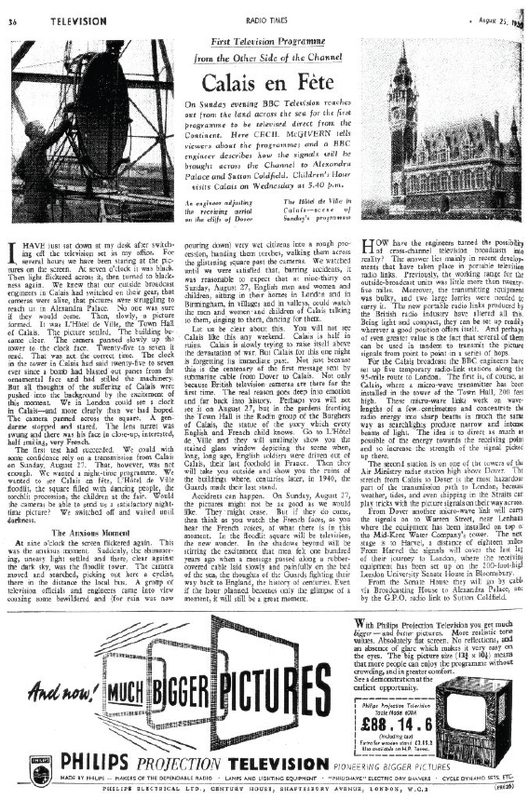 In addition, a relay chain linking Paris to London using the natural terrain (height), transmitters on buildings such as the casino in Cassel and temporary transmitters was necessary in order to transport the television signals from Paris to London and up to Scotland. The successful transmission and standards conversion were important tests for the transmission of the coronation of Elizabeth II in 1953 and the birth of Eurovision in 1954. Figure 1. 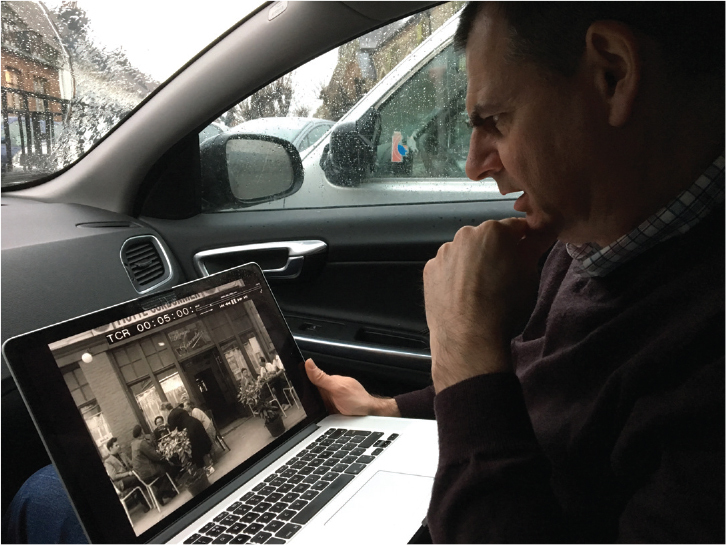 Andy O’Dwyer using original film material of 1952 (copied to a laptop) in order to identify the filmed locations in the town of Cassel/France. Figure 2. Announcement of the “Calais-Experiment” (25th of August 1950) – the first television transmission from France to Great Britain crossing the Channel. Source: Radio Times. Figure 3. 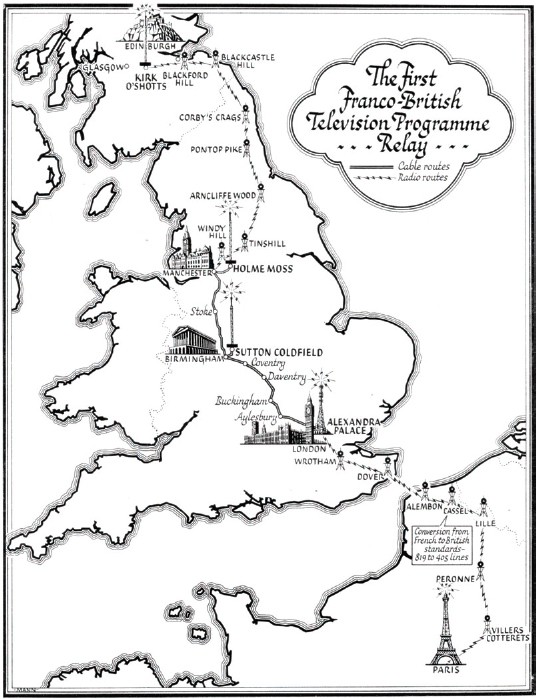 Artistic map of the “Paris Week” (July 1952) showing the relay links for the live transmission of television pictures from Paris to England and Scotland. Source: Radio Times. 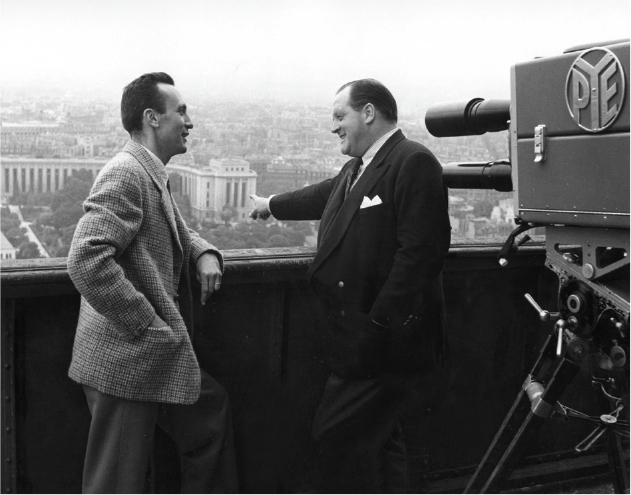 Despite some financial and technical hurdles, the Heads of BBC and RTF, William Haley and Waldimir Porché, decided in July 1951 to stage the so-called ‘Paris Week’ in July 1952. During several meetings of the Liaison Committee in London and Paris, all technical, organisational and programme related issues were discussed in detail. Jean d’Arcy even arranged a meeting between Richard Dimbleby and Etienne Lalou (see figure 4), the two elected presenters of the Paris Week, in order to harmonise their prepared commentaries. Starting with an opening broadcast from the British Embassy in Paris on the evening of the 8th of July, a total of 17 programmes were realized within a week - a tremendous effort and enourmous technical challenge for both the French and the British staff involved. The post-war European television landscape was characterised by a nationalistic techno-political battle over black and white television line standards. This post-war line standard debate must be interpreted as a techno-nationalist conflict of technical, symbolic and economic dimensions. Because of its network structure, the definition of a line standard had direct impact on the technical parameters and characteristics of all production, transmission and reception technologies of television as a large technological system: a case of techno-diplomacy in an emerging regulatory regime for transnational television in Europe. The experimental media archaeology journey (physically visiting the sites) brought a new layer of knowledge that could not be realised in any other way. Observing the topography (landscape) to see the chosen sights, Cassel, the towers of both Lille and Calais and Dover as ‘high-points’ to take the pictures from Paris to London made us aware of the fragility and - to a certain degree - ephemerality of television infrastructures. Most of the physical constructions (transmitters) have disappeared, and even buildings that hosted important equipment (such as the Casino in Cassel, where the line conversion was realised) disappeared or show no more sign of the former activities (such as the clock tower in Lille which hosted the first regional television studio in France). There seems to be little awareness for the material heritage of a technology that was once praised as most revolutionary invention in human history… Finally, one of the most exciting results of this experiment were the encounters with people on-site; their memories, also their astonishment to see two middle-aged men wandering around with a Laptop in order to identify places that were recorded on film some 65 years ago, made us aware of the important role that television has as a technology of memory. As such, the confrontation of the locals with the archival traces of the ‘Paris Week’ produced an interesting moment of communicative memory production, bringing two distinct or parallel traditions of the same event into contact with each other. As the locals had never seen the BBC documentary nor any other filmic sources covering the event, our media archaeological experiment has - in a certain way - broken down the transnational and European dimension of the event to the local level; and, the other way around, enriched the transnational story by local memories and knowledge. In this way, the idea of EMA - that it so sensitize the historian for the materiality and performativity of old media technolgies and to reflect on the sensorial and social dimension of doing media history in a hands-on and re-enactment approach - has without doubt proven its intellectual and performative usefulness in this EMA-journey. Figure 4. The two main presenters of the Paris Week on top of the Eiffel Tower: on the left the French speaker Etienne Lalou (RTF); on the right: Richard Dimbleby (BBC). Source: BBC archives. Figure 5. The BBC opening show of Television Centre on Wednesday 29th June 1960. 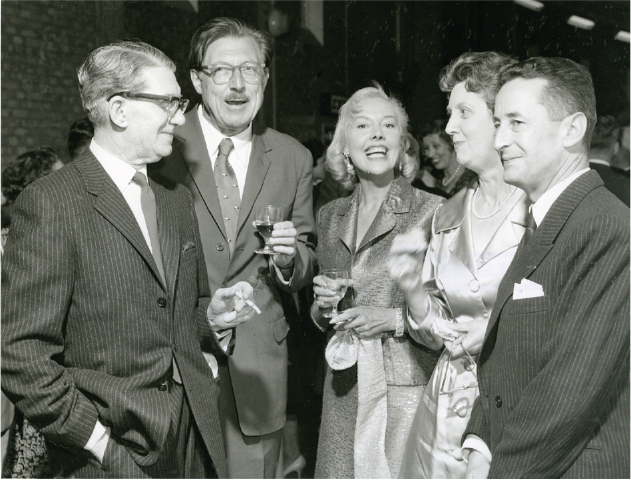 Among the guests were Cecil McGivern (left) and Jean d’Arcy (right) – two “techno-diplomats” that made the first transnational television transmissions in Europe their mission. Figure 6. 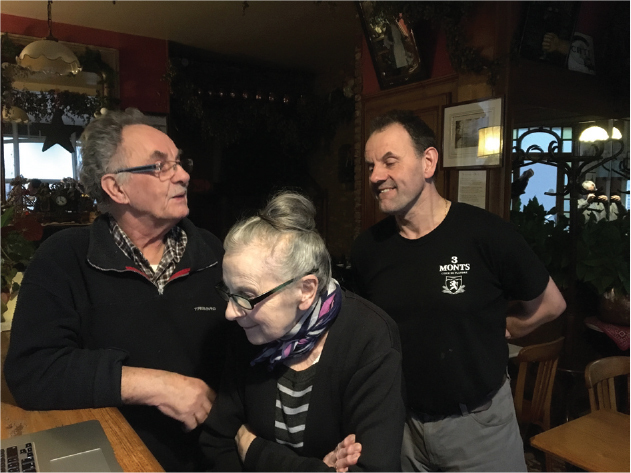 Scene from our site visit in Cassel: we show the BBC film “The Paris Week” to locals who had never seen the pictures before. Andreas Fickers is professor of contemporary and digital history at the University of Luxembourg. He is Director of the Luxembourg Centre for Contemporary and Digital History, the University’s third Interdisciplinary Research Centre. He is involved in major European research networks (‘Tensions of Europe Network,’ ‘European Television History Network’, the ‘Network for Experimental Media Archaeology’. Latest publications include Communicating Europe: Technologies, Information, Events (co-authored with Pascal Griset, Palgrave-McMillan 2018) and Materializing Memories: Dispositifs, Generations, Amateurs (edited with Susan Aasman and Jo Wachelder, Bloomsbury 2018). Alexandre Germain is multimedia technician at the MediaCentre in the University of Luxembourg. He has come from a long career at the Centre Virtuel de la Connaissance sur l’Europe (CVCE) where he was working in digitizing audiovisual materials, and was in charge of all video productions, including all the oral history project. He specialized in audiovisual archiving on Media Assets Management systems and streaming video. He’s also involved in user’s experience and ‘ergonomic relationship’ between multimedia publishers and their respective audience. Andy O’Dwyer is head of the Digital History-Lab of the Luxembourg Centre for Contemporary and Digital History (University of Luxembourg) and has come from a long career at the BBC, working in archive preservation and digitization of audio-visual material. He later moved into BBC Research & Development as a Technologist. There he focused on projects involving scanning, usability and enabling online access for both researchers and the public to the BBC’s collections. He is also a contributing author of the book ‘A European Television History’ (Bignell and Fickers eds., Wiley-Blackwell, 2008) and coeditor of the book ‘User Studies in Digital Library Development’ (Facet Publishing, 2012).